Sometimes our eyes cannot see what is right in front of them. Sometimes are minds cannot comprehend the things we are glaring at. These optical illusion faces completely blend in their surroundings. 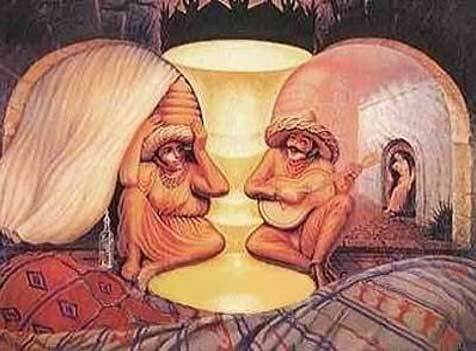 Optical illusions will never cease to amaze people and this shows we are not really as intelligent as we think we are. Let’s see whether you can outsmart this mere illusion. Look at this picture of a scene outside a medical tent. 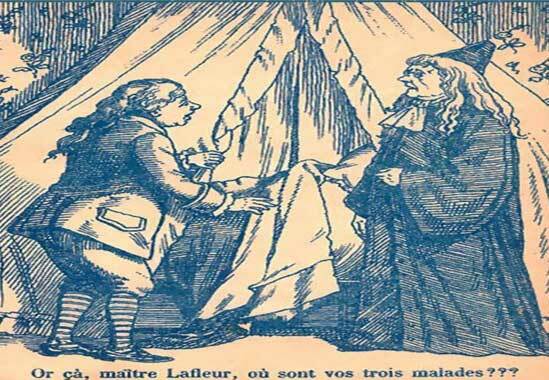 This French description translates to “So, mother Lafleur, where are your three patients”. There are three patients hidden in this picture in such a way that it is almost impossible for a human eye to detect them right away. Found them yet? Perhaps you do not want to miss any ‘small’ details if you are seriously up to the challenge so take your time before looking at this next image. The hint is, keep staring both of their faces with focus. You will find a woman and a bearded man. 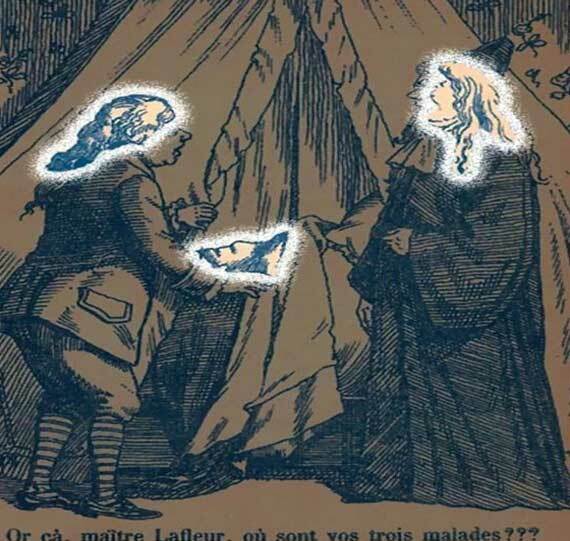 Illusion like these will constantly challenge your eyes and brain. Only those with high level of IQ and keen sense of observation can outsmart illusions like these and this comes with constant practice. Sometimes there are certain images which can only be seen if our head and eyes are in certain position or in certain motion. Have a look at this picture. 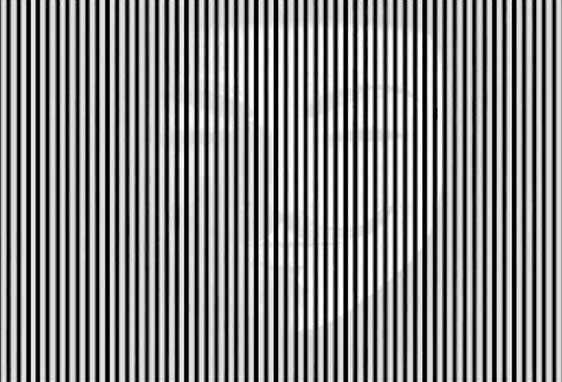 If you constantly shake your head left to right, you will see the famous masked revolutionary. This trick even works when looking at this picture from sideways. The high contrast of black and white lines trick our eyes when you see this picture completely straight. When you move your head or look at it from a tilted position, the brightness of contrast becomes a bit blur and the light sensitivity increases which enables us to see the background image. The trick looks pretty slick. Have a look at another amazing picture which illustrates faces drawn with such a versatile touch and it is quite easy to detect as well. All it requires is a perfect eye brain combination along with good spatial focus. Sometimes the brain cannot process the hidden images because it does not know the exact position where it is situated. Notice how easily you can detect the images once you know the exact location. These kinds of optical illusion also enhance our observation. IF YOU LIKED THIS PEOPLE HIDDEN WITHIN PICTURES, YOU’LL DEFINITELY WANT TO CLICK OVER AND CHECK OUT OTHER ILLUSIONS IN SPOT THE OBJECT CATEGORY! Um, why have you stopped updating? I enjoy your site (and this post)!